The children gather together at circle time as we greet all our classmates. Our goal is to become a school family as we “check in” with one another. We begin early math readiness skills through our discussions about the day, month, and year during calendar time. The children are assigned a day each week for the entire school year. They are encouraged to bring an item from home to show and share with the class or something special they have made. The teacher or students will ask questions about their selection. It is through show and tell that children acquire expanded language skills, while the class, as a whole, gains valuable listening skills, as well. Your children will also begin to build self-confidence and self-esteem as they share their unique selections. Play is a vehicle of growth for the young child. During free play, children learn to interact with each other and play cooperatively. Playtime affords a child the opportunity to share, think, and to problem solve. Play is hard work for the 3, 4, and 5 year olds. A variety of toys in the classroom encourages children to use their wonderful imaginations and build upon their creative, dramatic play while developing their gross and fine motor skills. Music is the universal language in our classrooms! Our classrooms are equipped with musical instruments and opportunities for children to explore rhythm and song. The Early Childhood music selection includes CDs of popular children’s songs, classical music, modern pop, show tunes, instrumental, Hebrew, and holiday music. The children in the preschool often participate in a parade using rhythm instruments as we march through the classrooms and playground. Your children will learn many songs during the course of the year and participate on stage. The children will have an opportunity to explore their creativity using a variety of art media. Paints (including tempera, watercolors, and biocolors), markers, crayons, colored pencils, tape, glue, scissors, glitter, and felt are a few of the myriad of materials the children will experiment with in the classroom. It is important to remember that it is the process, not the finished product that matters! We want your children to feel proud of their creations! Preparing and celebrating Shabbat is a special time within the Early Childhood department. The children welcome Shabbat by singing the blessings over the candles, reciting the Kiddush-blessing over the wine (grape juice) and singing Shabbat songs. The preschool children bake Challah every week. The pre-k class visits the computer lab on a weekly basis. Each child is assigned their own computer for the duration of the semester. Developmentally appropriate software is available for the students. The children use the computers as a tool in their learning. 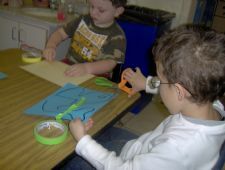 The children learn to follow directions, match objects, and are introduced to beginning reading readiness and math readiness skills. The children often enjoy drawing pictures using the computer and navigating the mouse.